Double sente is relative. It depends on what else is on the board. 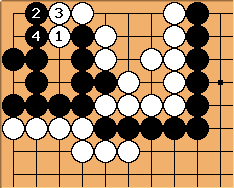 Every Go position can be categorized as sente, gote, or ambiguous. 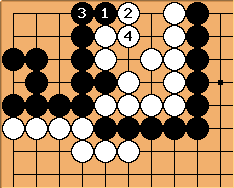 Any play, whether a sente or gote in the abstract, can be a double sente if the reply when either player makes the first play is larger than anything else on the board. Usually, double sente are played as soon as they arise. which has a local score of 5.
which has a local count of -2 (2 points for White). Later this is White's sente. And even later, this is Black's sente. The local score is -2. After White's hane, Black's reverse sente is worth three points. The local score is 1. The original position is a seven-point sente for Black. However, when the ambient temperature drops below 3 points, it is double sente (as a rule). However, Black is unlikely to allow that to happen. Beware of so-called double sente. For instance, Kano's "Yose Dictionary" gives the following as a two-point double sente (p.30). 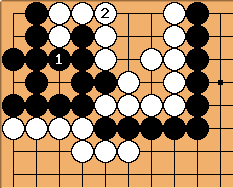 After the exchange of - , White has a one-point sente sequence with - . The score is +5 (for Black). After the exchange of - , Black has a one-point sente sequence with - . The score is +3. If this is a double sente, then whoever plays it picks up two points (by comparison) for free. But do not be misled. This is actually a gote play, worth about 3 2/3 points (miai value). After , is a gote play worth about 2 1/4 points. If there are bigger plays on the board, White is unlikely to respond to . After , is worth slightly more than 3 points. 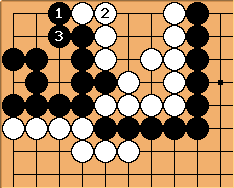 So if there are plays worth between about 3 2/3 and 3 points elsewhere, Black is unlikely to respond to . This is a middling gote play. Do not think of it as a double sente. Tas: Which is why they actually ought to be considered part of a larger sente or gote sequence, although it might be outside anyone's reading ability.